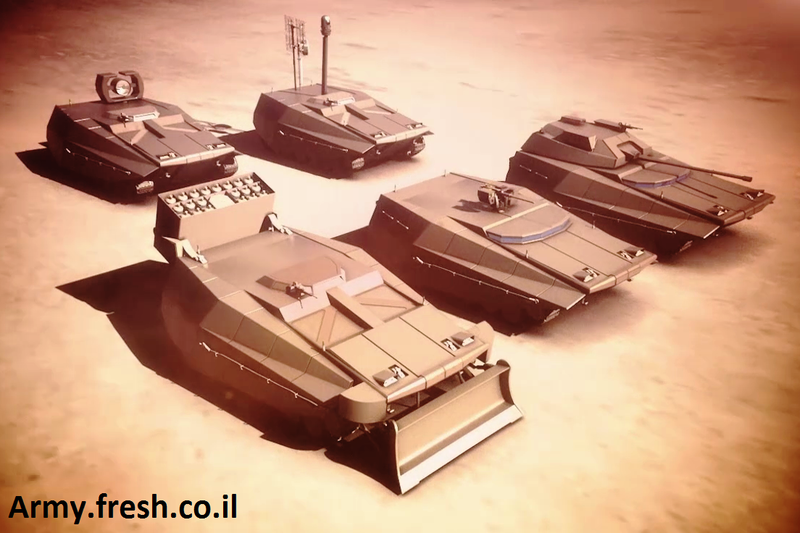 The Carmel is said to have a combat weight of 30 to 35 metric tons, which is about as much as the new wheeled 8x8 Eitan armored personell carrier (APC), currently being developed by MANTAK for the IDF. This weight level is considerably less than the weight of current heavy infantry fighting vehicles such as the German Puma at 43 metric tons and the Russian T-15 Armata at 48 metric tons. 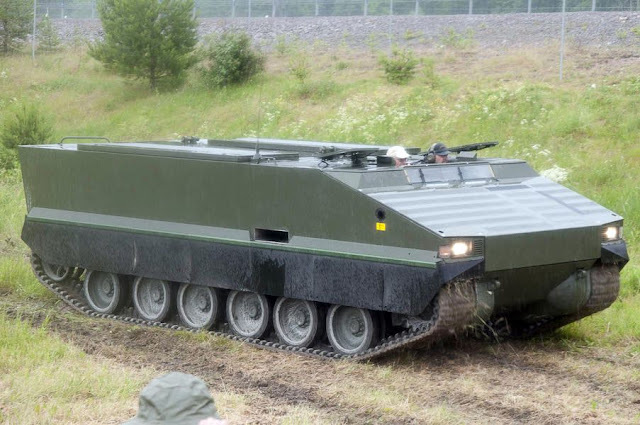 The Carmel is not an IFV, but what might be it's closest Western counterpart - the British Scout-SV Ajax (based on the ASCOD 2 chassis) - also is a few metric tons heavier than the expected weight of the Carmel. The closest Russian counterpart to the Carmel might be the BMPT/BMPT-72 Terminator fire support vehicle designed by the Russian company UVZ. 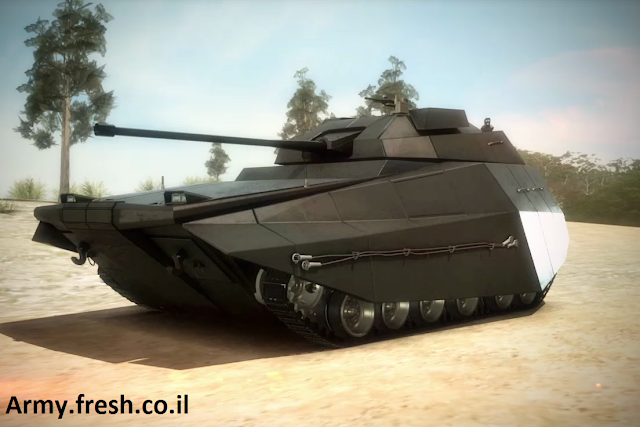 The Carmel is claimed to be rather inexpensive compared to heavier vehicles like the Merkava 4 and Namer. The potentially smaller internal volume of the Carmel's hull might be able to negate the lower weight, but this is not confirmed - the opposite might just as well be possible: the larger turret and main armament of the Carmel (compared to vehicles like the Puma and the T-15 Armata) could result in a lower level of ballistic protection. The frontal aspect of the vehicle is most likely protected against 25 mm or 30 mm APFSDS ammunition. Depending on the internal volume and protection level of the turret - an unmanned turret can be designed with an intentionally lower level of armor protection, if a mission kill is considered acceptable - the vehicle's hull might be a bit better protected; however the sense behind such a decision would be questionable, given that no country in the region currently operates an infantry fighting vehicle or scout vehicle armed with a 35 mm or 40 mm gun - i.e. a higher level of ballistic protection would lead to no gain in actual protection. The side armor in the 3D renderings appears to be rather thin, probably being designed to resist smaller threats than the frontal armor. A common design choice for current APCs and IFVs is side protection against 14.5 mm AP(I) ammunition aswell as smaller EFPs (explosively formed penetrators), which are launched by certain types of anti-vehicle mines and EFP-IEDs. 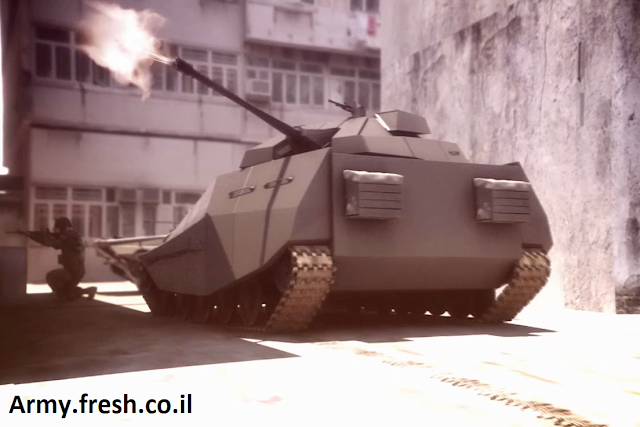 Unlike other Israeli armored fighting vehicles (AFVs), the Carmel doesn't make use of explosive reactive armor (ERA) according to the simulation from Didi Ben-Yoash. Past Israeli combat vehicles such as the much heavier Namer APC, versions of the Sho't and Magach main battle tanks (MBTs) aswell as the Pereh anti-tank guided missile (ATGM) launcher vehicle were fitted with ERA. 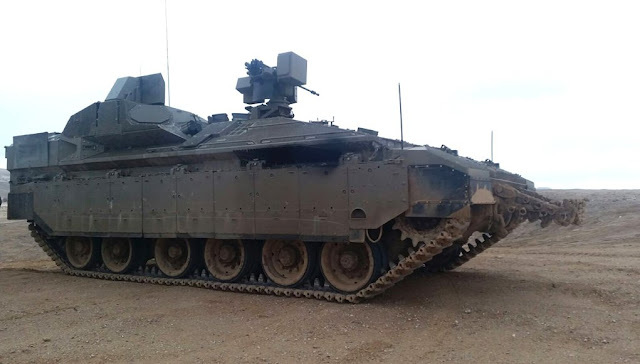 The latest version(s) of the Merkava 4 tank supposedly make use of hybrid armor, incorporating ERA layers inside it's relatively thick composite armor array. Instead of using ERA, the Carmel will be relying only on active protection systems (APS) for protection against guided and unguided anti-tank weapons. Other than the Carmel utilizing both softkill and hardkill systems, no further details on the exact type of APS have yet been disclosed; there are however multiple local options. The Trophy APS from Rafael, adopted on the upgraded Merkava 4M MBT and the Namer APC, could be used on the Carmel; this would reduce costs and allow all three vehicles to utilize the same countermeasures, easing the logistic processes. A version of this systems suited for medium weight vehicles already exists in form of Trophy-MV, incorporating hardkill and softkill measures. However the Trophy APS should be considered a relatively "bad" APS, having several unique drawbacks in comparison with other active protections ystems. Iron Fist, the active protection system developed by the company Israeli Military Industries (IMI), is a more capable option for the Carmel. Currently the Netherlands and the United States are testing this system for possible adoption on some of their AFVs. Iron First already integrates a limited amount of softkill measures (i.e. infrared jammers) and provides a higher short-time multi-hit capability (having usually four countermeasures ready compared to only one per flank in case of Trophy) with lower collateral damage (thanks to using HE blast grenades). A third option would be a combined development from Rafael and IMI, which supposedly is being worked on by the two companies on behalf of the IDF. Such a system might be able to combine the advantages of both APS types without including their drawbacks. Even with APS, the Carmel will only be protected against small/medium calibre ammunition and shaped charge weapons such as rocket-propelled grenades (RPGs) and anti-tank guided missiles. Currently no APS is capable of dealing with large calibre kinetic energy penetrators (KEPs) such as APFSDS ammunition fired by main battle tanks and EFPs in such a way, that the relatively low amount of passive base armor of the Carmel would be capable of absoring the residual penetration of the KEP fragments. A high level of protection against mines and improvised explosive devices (IEDs) is required to minimize casualties in the operational environment of the IDF. Heavier Israeli vehicles like the Merkava 4 tank and the Namer APC are fitted with thick add-on armor at the belly plate of the hull. Together with the v-shape of the hull bottom, these vehicles are believed to have a very high level of mine protection. It seems likely that the Carmel will also adopt a similar design; theoretically the anti-mine plating could be reduced to cover only the bottom of the crew compartment, a design used on some MRAPs (mine-resistant ambush protected) vehicles. This however would also increase the likelihood of a mission or mobility kill. The Carmel has a front-mounted engine, which in some cases can improve the crew survivability against mines and IEDs. In particular when the detonation of the explosive charge is triggered by pressure or a trip wire, having the crew seated at the rear of the vehicle reduces lethality rates. However when the mines/IEDs are connected to a fuze triggered with a delay or by a thermal signature, the front-mounted engine might result in a higher probability of the explosive charge detonating below the crew compartment, increasing the probability of wounded crew members. The vehicle is to be manned by a crew of two, but supposedly provides enough space for up to three men. The small crew size is possible, because the vehicle makes use of several new technologies in order to assist the operators; in some ways the crew only needs to monitor the vehicle. During the 1980s, 1990s and early 2000s, several countries inlcuding Germany, the United States and (Soviet-)Russia investigated two-men crews in their main battle tank (MBT) development programs. In general the conclusion was made that tanks (or tank-like combat vehicles) with a crew of only two men are possible, when using advanced optics, properly integrated C4ISR systems and components that allow automatic target recognition, target identification and aiming. Automated driving (potentially based on pre-designed routes using check points) is claimed to be a feature of the Carmel. 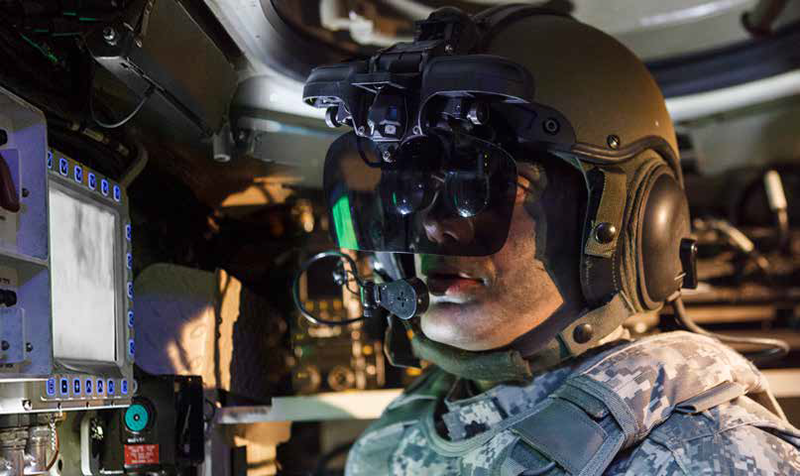 The Iron Vision system from Elbit, often described as "see-through armor" based on an augmented/virtual reality head mounted display is expected to be fielded on the new vehicle. A problem with reducing the crew size from four to two (or three) is that a lot of tasks aside of operating the vehicle usually require additional workforce. Primarily having two soldiers for working on the tank is a problem when trying to repair the vehicle in combat conditions and when doing certain maintenance tasks. When having more crew members it is also possible (though not necessarily common) to specialize each soldier in a secondary skill: i.e. one man could receive an additional training in mechanics, one other soldier could be taught on fixing the electronics, while another crew member could learn how to properly threat some of the less common medical issues; reducing the crew also reduces the possibility of having the same amount of secondary skills. It is possible to negate the impact of crew reductions by assigning more soldiers to one vehicle, increasing the support staff for the Carmel or by letting the vehicles operate in pairs, that are meant to help each other. How suitable these solutions are is a question that can only be answered after proper combat experience. In the renderings from Ben-Yaosh's simulation, a relatively large unmanned turret is located ontop of the rear-most section of the Carmel's hull. This happens to be an unspecified type of turret; in reality a modified off-the-shelf design from IMI or Elbit Systems could be used on the Carmel in order to reduce costs. 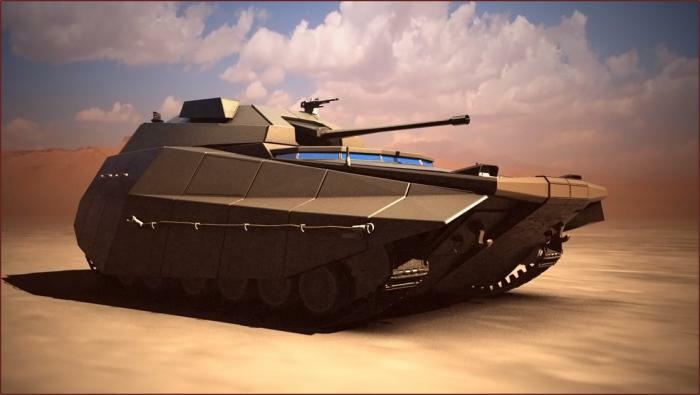 This however would most likely reduce the turret protection to STANAG 4569 level 4 at most, giving enemy IFVs the options to cause a mission kill or firepower kill. The Carmel is said to be armed with a medium calibre autocannon with high elevation, and anti-tank guided missiles (ATGMs). The exact calibre of the gun has yet to be revealed, but it is expected to be within the range of 30 to 76 millimetres, speculations often speak of either a 40 mm or a 60 mm gun. The latter calibre was developed by Israeli Military Industries (IMI) together with the Italian company Oto-Melara. The cooperation of both companies lead to the Hyper-Velocity Medium Support Weapon (HVMS) gun, a 60 mm high-pressure gun capable of penetrating 120 mm steel armor at 60° at a distance of 2,000 metres when firing APFSDS ammunition. This is achieved by a rather high pressure of 427 MPa, compared to 350-370 MPa for 30 x 173 mm APFSDS rounds, 420 MPa for 35 x 228 mm AP(FSDS) rounds and ~400 MPa for ammunition fired by the 40 mm Bofors L70 gun. A problem of the HVMS gun is that it has lost it's biggest selling point - the ability to destroy main battle tanks (MBTs) with the introduction of heavier armored tanks. The high pressue is created by using a larger propellant charge, which negatively affects weight and size: the weight of 60 mm ammunition is between 6 to 7.2 kilograms, depending on ammo type; this compares to 750-860 grams for a single 30 x 173 mm round and ~2.5 kilograms for a 40 mm Bofors L70 HE round. Having a larger calibre can lead to less stowed rounds, which will depending on scenario lead to less stowed kills. When engaging large groups of soldiers, a larger round is capable of injuring or killing more soldiers at the same time. When engaging lightly armored vehicles or smaller groups of soldiers outside the range of the coaxial armament (such as a two-men ATGM team), then a smaller calibre can provide the same lethaliy per round, while providing greater ammo stowage. The Carmel is said to be specifically optimized for urban combat, which creates another set of operational requirements. If the main gun is not powerful enough to penetrate even thicker walls, then it is rather useless in urban combat; however if the ammunition has too much penetration power or too much explosive/fragmentation payload, then it increases the possibility of collateral damage by a large factor. Finding the right balance and the right ammunition mix seems to be extremely important; here programmable ammunition (requires at least 30 mm calibre for a decent payload) and ammunition with enhanced after-armor effects (provided by ammunition such as FAPDS, FAP, PELE-Pen) seem to be desirable. The Carmel is powered by a front-mounted engine; according to Israeli sources, this could potentially be a diesel electric drive system. Diesel-electric drives for armored fighting vehicles have been a topic of research and development since the 1980s, although the earliest proposals such as the Holt Gas-Electric Tank from 1918 "date all the way back". Diesel-electric drive systems are expected to provide a number of advantages such as greater flexibility when arranging the powerpack components inside the vehicle, higher reliability, reduced wear and purely electrical silent running ("sneaking") capability for a short period of time. A problem of diesel-electric drives is the increased weight and volume compared to currently existing diesel engines; increasing the weight and volume relative to it's power output doesn't make much sense, when trying to make the AFVs like the Carmel lighter compared to existing vehicles. A slightly more conventional hybrid system - as used on the infamous civillian Toyota Prius or using a electric-mechanical drive system seems to be more benifical based on the current state of technology, although a conventional diesel engine might still provide most performance per weight and volume. However the Carmel still might be fitted with a diesel-electrical drive system for another reason: technology development. It's not very uncommon in the military to adopt new technology, that offers little to no advantages over existing solutions, just to fund the development of future, improved variants of the technology. A diesel-electric drive doesn't need to be better than existing diesel engines, if the military is convinced that it has the potential to become better in the future - something that is generally accepted. The M1 Abrams' AGT-1500C gas turbine is a prime example for such a choice; it wasn't better than other diesel offerings of it's time, but the Army (apparently falsely) believed that gas turbines were the future of ground combat vehicles. The German Puma IFV was designed specifically with the idea in mind to reuse new technologies in future AFVs. The Carmel is expected to utilize rubber band tracks, potentially segmented ones, which would allow easier repairs and maintenance compared to the currently more common continous rubber band tracks. The computer generated renderings from retired General Didi Ben-Yaosh show a vehicle with a rather bad shape of the frontal hull - the hull front is extruding more than a feet over the tracks. This would result in the vehicle having extremely poor off-road mobility: When driving down a hill, the overlapping hull front could touch the flat ground before the tracks (at the drive wheels in particular) reach it; the vehicle would get stuck in such a case. Likewise when trying to climb up a steep slope, the overlapping hull could touch the slope before the track section reaches the sloped ground. The renderings from the Carmel simulation also show a number of further vehicle variants, which have not been officially confirmed yet. If the exact type of other variants is speculation on the side of Mr. Ben-Yaosh or result of sources not available to the public (or atleast not available in English) is not known yet. In 2016 the European Security and Defence magazine mentioned only four overall Carmel versions (including the autocannon-armed fire support variant), which appear to be different from the ones shown in the renderings. The four other simulated Carmel variants are apparently a command and control vehicle (mobile command post), a mine-clearing vehicle similar to the US-American Assault Breacher Vehicle (ABV) fitted with rockets and a dozer blade, a scout and/or electronic warfare vehicle, and a further variant, which houses a large searchlight or laser effector, which might be used for CRAM (counter rocket, artillery and missiles) purposes. More than two years ago, the author of this article suggest a somewhat similar vehicle, designed for urban combat and operated by a unit specialized in urban combat - there are specialized mountain infantry and coastal rangers in some militaries, so the latter suggestion seems reasonable. The idea was discussed in another forum, a blog post later meant to go online on this blog was (like so many other posts) started, but was never finished. Main battle tanks are not capable of dealing with all issues of modern combat, being too heavy for many cities and thus being incapable of crossing older bridges or driving in areas with tunnels/subways. All current tanks are also lacking the gun elevation, some also the roof armor, to fight in cities with larger buildings, which would allow enemies to target the vehicles from above. The lack of scalability of tank ammunition in urban combat seems to be a further issue, just like the huge physicial size of a proper MBT. While the Carmel seems to be a step forward, it appears still to be less than ideal based on the available news reports and the simulation from former Brigadier General Ben-Yoash. This might mean that the Russian BMPT - being operated by Kazakhstan only - might still be the best urban combat fire support vehicle, even after the Carmel entered service. "The Carmel is powered by a front-mounted engine; according to Israeli sources, this could potentially be a diesel electric drive system. Diesel-electric drives for armored fighting vehicles have been a topic of research and development since the 1980s, although the earliest proposals such as the Holt Gas-Electric Tank from 1918 "date all the way back". Diesel-electric drive systems are expected to provide a number of advantages such as greater flexibility when arranging the powerpack components inside the vehicle, higher reliability, reduced wear and purely electrical silent running ("sneaking") capability for a short period of time. A problem of diesel-electric drives is the increased weight and volume compared to currently existing diesel engines; increasing the weight and volume relative to it's power output doesn't make much sense, when trying to make the AFVs like the Carmel lighter compared to existing vehicles. A slightly more conventional hybrid system - as used on the infamous civilian Toyota Prius or using a electric-mechanical drive system seems to be more beneficial based on the current state of technology, although a conventional diesel engine might still provide most performance per weight and volume. " This kind of system allows full power at silent mode, and also more powerful regenerative breaking and better acceleration. It also lacks a proper gearbox, the closest being the final gear ratio at the sprocket. Also, it is more efficient than a conventional drivetrain. The engine runs at a constant RPM. In a parallel hybrid, the power systems are set up to work parallel to each other. Usually this means: Engine-Electric motor-gearbox-sprocket. This means you can utilize the engine's power directly, and on top of this, add the extra power of the electric motor for a short time. You can also run in silent mode at lower power. The electric motor also doubles as regenerative breaks and a alternator. On top of this, you can mount a electric motor on the turbochargers driveshaft, and eliminate turbolag, and harvest the rest power from the turbo to power the vehicle. The system can be either soft, a smaller electric motor for a better torque curve, regenerative breaks and added power. Or full out, with a large electric motor the at the same power as the engine. In a series/parallel, you use both systems. Here you have first a parallel system, which feeds into a torque converter instead, which can lock at higher speeds. After the torque converter, the power goes into the sprocket, but with a electric motor between the torque converter and the sprocket. Here the engine is always running at a constant RPM, and the first electric motor can be used to charge the system to power the other two. Or you can run everything at full power, the engine, and 3 electric motors. Series: Most popular in military systems, any hybrid tank actually. Parallel: Any car hybrid almost. Hybrid-electric systems offer more power now than conventional ones, so I would rather see a power density increase, rather than a decrease. You'll find more info at SH in the transmission and tank layout thread. 1)The protection is not a function of the weight. It's the other way around. The goal is of course not to go for a 30 or 35-ton vehicle, because the Israeli infrastructure and tactical/strategic mobility requirements do not call for such a "small" weight. Rather, the Carmel will presumably pack a level of protection similar or close to the Merkava 4 and possibly Namer (which is better protected) while attempting to retain a low weight. If after all the weight reduction methods will not result in the goal weight of 30-35 tons, they will simply settle for a higher weight of 40 tons or above. Basically, it's just a weight figure they're striving for, but not required to obtain. It was highlighted in numerous interviews regarding the Abrams, that its weight could be reduced to the low 50-ton class if only modern production technologies and modern materials are used, assuming without restructuring. 2)An off-the-shelf turret, which is unlikely given that it is a clean sheet design aiming to incorporate all the latest technologies that will not yet be exported at the time. It will be less than ideal. However, available turrets, at least from Elbit, do sport a protection of STANAG 4569 level 6 (30mm APFSDS protection). The most recent is the UT30-Mk2 which was sold to Philippines and took part in the LAND 400 Phase 2 bid in Australia, although in both cases it only had a level 4 protection. Here you can see they claim protection from level 2 to level 6 depending on demand. Obviously, however, Israel's status in NATO is constantly improving and it seeks to become more involved, but it is not officially a NATO member and also given its different reality on the ground, it does not pursue NATO standards in solely domestically used systems, especially in relation to armor. 3)Trophy is not considered "bad" neither domestically nor internationally. The US is testing it with good results, and the IDF commanders are only talking about who gets to have the newest APCs and tanks with an APS. Its main disadvantage is that it is only effective vs HEAT and HE warheads, and cannot defeat kinetic threats other than simply damaging them. At least in the current iteration. However, it was not seen as a disadvantage in the IDF up until perhaps recently. And it's not confirmed if it's now seen as a disadvantage. The IDF needed something to defeat long range ATGMs and short range ATRs. In this scenario, the Trophy outmatched the Iron Fist and was also more technologically mature. But even years before Trophy was adopted, it was said that an anti-kinetic variant was being developed and even tested with positive results. Obviously not requested by the army. Only now there is a requirement for anti-KE. And perhaps its biggest disadvantage is not more than a myth: it is unsafe. The reality is that a missile hitting the tank would pose a far greater threat than an entire interception process, and that the risk to nearby infantry is not greater than that posed by ERA used on different tanks, including the Abrams' TUSK. The notion that procedures were given to cope with a survivability issue with the Trophy is false and denied by numerous army officials. Safety procedures for infantry near tanks and APCs were given long before APS was deployed, and they instructed infantry to walk a safe distance from armored vehicles either way. We repair and replace ABS sensors, abs ring, abs pump for all makes and models in Reading, United Kingdom.We also provide free collection and Delivery service from your home or place of work. Merkava with ears? It's ALWACS!